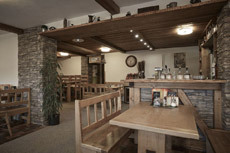 The restaurant offers its guests a variety of meals of the Czech and international cuisine. 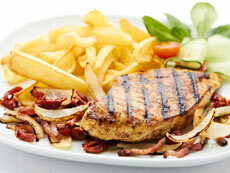 All dishes are home-made from selected foodstuff focusing on quality. The restaurant offers a selection of popular meals so it will be easy for you to make a choice, and you will certainly like some of our specialities. As regards beverages, we recommend quality wine from Habánské Cellars or a glass of properly cooled Czech beer, Pilsner Urquell and Radegast. Children, teetotallers and drivers can get, besides standard soft drinks, the Fentimans English lemonade with all flavours. Those who prefer hot drinks can choose from the offer of quality loose tea, the Choc-o-lait luxury Belgian hot chocolate, and CosmaiCaffé, the excellent coffee. As for aperitifs, get-togethers with friends, or warming oneself up, we offer a wide range of alcoholic beverages, particularly attractive for those who like quality old rum or the Fassbind fruit spirits. And for women, we offer a wide selection of liquors from reputable producers. We aim to focus on quality to which we add our determination and care to make you satisfied as much as possible.